A fun bridal shower idea is to have a speciality kitchen shower. 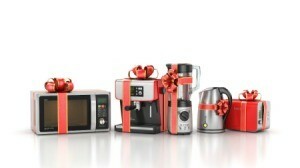 The gifts will be aimed at helping the new couple outfit their kitchen. Food and games can be planned using a kitchen or food prep theme. This is a guide about planning a kitchen shower. A very useful shower for a Bride-to-be is a Kitchen shower. This will help her stock her kitchen with small appliances, utensils, kitchen towels and recipes as well. It is helpful to know if she will decorate with a certain theme so you can make note of it on invitations. As for invitations, to save money you can print them with your computer and printer, using a catchy little phrase like "WHAT'S COOKIN'?" It's a kitchen shower for ___ you finish the rest. When I hosted a kitchen shower for a niece I sent a nice embossed recipe card along with the invitation asking that they return it to help her begin her recipe collection. Most guests brought them to the shower attached to their gift. As a gift I gave her a nice recipe box to hold them. For decorations a simple cluster of grapes and fruit with a candle can be used. No real expensive decorating for a kitchen shower. And with the end of the summer markdowns, gingham tablecloths would be cute. On the Grape theme I love using Sage green and Cranberry for a more formal look. As favors, a little bottle of spice with a tiny bow tied around it is nice. I even put together a little book of kitchen tips and substitutions. On the cover the Kitchen prayer, "Bless this little kitchen, (there's more to it) and put the couple's name and wedding date. Not really expensive at all. Just a little homework, looking up the contents you want in the booklet. A nice centerpiece, which can be YOUR gift to the Bride-to-be is a small basket filled with small utensils, kitchen towels and pot holders. 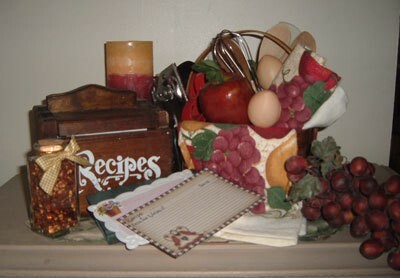 Be creative, and include a recipe box to go with the recipe theme. For games, how about a kitchen utensil word scramble,a "memory" game with a tray of small utensils, etc. that is passed around and then taken away and the guest lists what they saw. Another cute game is a FAVORITE CAKE GAME. Example: Santa's favorite--Red Velvet. Bride's favorite--Groom's Cake. Mickey Mouse's--Cheesecake. Chocolate Lover's--Fudge cake. Brainstorm to think of others. As for food, ask a few of the close family or friends to help you with a favorite snack ALONG with the recipe for the Bride-to-be. They could even include an ingredient or utensil needed to make the recipe as a small gift. Kitchen showers are a fun alternative to traditional shower and can be kept small and simple for family and close friends or done as elaborately as you would like. I hope these tips will be helpful in planning your next shower. When we had a shower for my younger sister I went to the local grocery store & borrowed a grocery cart. We decorated the cart & filled it up with spices, potholders, dish clothes, towels, small kitchen utensils ( peeler, knives, etc) & some staples. She was marrying a ppeop in the navy so they needed all the help they could get. Believe me it was very much appreciated. All those things get expensive for a new bride! YOUR IDEA ON A KITCHEN SHOWER IS GREAT!! SOUNDS LIKE SUCH FUN AND LOTS OF GREAT INFORMATION AND GIFTS FOR THE BRIDE. LOTS OF FUN FOR THE FRIENDS WHO COME. I LOVE IT!! LOTS OF PEOPLE WOULD ENJOY COMING! the guests could also bring canned foods that maybe are exotic or expensive. like asparagus or cavier or even champagne. anything that would be used in the kitchen.